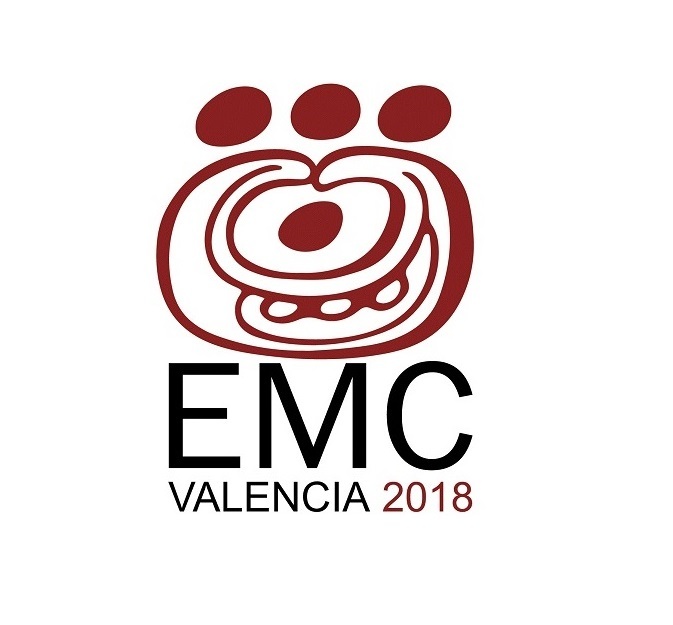 The 23rd European Maya Conference is co-organised by WAYEB, the European Association of Mayanists, together with the University of Valencia and the Polytechnic University of Valencia in Spain. The conference will begin with an introductory lecture to the workshops on Monday November 5th, followed by three-day workshops and concludes with a two-day symposium held from Friday November 9th to Saturday November 10th 2018 at the University of Valencia / Polytechnic University of Valencia. Cristina Vidal Lorenzo and Gaspar Muñoz Cosme (main organisers, Universidad de Valencia and Universidad Politécnica de Valencia). Núria Feliu Beltrán, Patricia Horcajada Campos, Nuria Matarredona Desantes, Esther Parpal Cabanes, Andrea Peiró Vitoria, Silvia Puerto Aboy , Mª Luisa Vázquez de Ágredos Pascual (researchers, Universidad de Valencia and Universidad Politécnica de Valencia). WAYEB, Generalitat Valenciana, Universidad de Valencia, Universidad Politécnica de Valencia, Comité Español de Historia del Arte, Centro Cultural La Nau, Departamento de Hª del Arte y Facultad de Geografía e Historia de la Universidad de Valencia, Escuela Técnica Superior de Arquitectura de la Universidad Politécnica de Valencia. 1) In the first session, entitled “Women in the ancient Maya culture”, research will be presented which, from a gender perspective, will contribute to making visible the role played by women in the ancient Maya society, with special emphasis on their participation in political relations between the different kingdoms of the Classic Maya period, contributions to the productive system as well as their pivotal role in religious and ritual events. This will be addressed from a variety of different disciplinary approaches, including archaeology, iconography, epigraphy, literature and anthropology. 2) In the second session “Explorers in the Maya area of the 19th and 20th centuries and the first scientific research led by women” will highlight the work of women explorers of the 19th and early 20th centuries, despite the adverse conditions encountered in the rainforest of the Maya area, in search of ancient ruined cities to document them through photographs and drawings of high quality, and whose names have been unduly left in unfair anonymity. The session will also address the contribution that scientists such as Tatiana Proskouriakoff and Linda Schele, among others, have made to the field of architecture, art and Maya epigraphy. This will allow a reassessment of their work in light of technological advances of the 21st century, which will be of great interest and heighten the scope of their initial contributions. 3) Finally, the third session “Women in contemporary Maya society” will focus on the role that women play in today’s Maya society, especially with regard to the preservation of ancient traditions, while at the same time addressing the gradual loss of power that has been experienced throughout the history of this culture. For further information, please contact the Wayeb Conference Board or the local organisers at emc2018@wayeb.org. The EMC Workshop Handbook is available for download in English, Spanish, French, Polish.